Last weekend was the opening of the Wisconsin catch and release trout season and many fly fisherman consider it to be a true sign of spring. I know many people who went out fishing last weekend and others who are planning on hitting the rivers in the coming days and weeks. I didn't get out last weekend, but I am planning on getting out in the coming days. For me this is a reminder to find all of my equipment and put it all in one place so I can get to the river and have everything I need. This past winter I tied a bunch of flies to replenish the fly boxes just like I did last year. The one thing I have done different this year, is actually putting the fly boxes in with the rest of my fly fishing gear. This is a pretty simple task, but last year I forgot to do this before my first time out fishing. It meant borrowing flies from the guys I was fishing with as most of my flies were at home with my tying materials. Fishing in March is also usually a little colder than in April or May which means that some additional clothing is often needed to stay comfortable. I like to put a couple pairs of wool socks in my wader bag along with some long underwear. This way I know I will have some warm clothes for the cool March mornings, no matter how fast I rush out the door. Another thing I like to do is go through all of my equipment and check the condition. This again is based off past experiences of getting to the river in March and after wading for about 30 minutes having a damp foot. A damp foot in June isn't so bad, but in March it is not fun. If you do discover you have a leak now is a great time to go to your local fly shop (The Fly Angler or Bob Mitchell's Fly Shop) and buy some new waders. Another important item is a fishing license. Of course you always need your license every time , but if you haven't gone fishing for since October you might need a little extra time locating it. About this time of year everybody is beginning to wonder when and if spring will ever arrive. I really do love winter and everything you can do on frozen water or snow, but as a fly fisherman I really like moving water. A good thing about living where we do is that many of the spring fed streams and rivers are actually open in the winter for fishing. Every year I try to get out at least once sometime in from January to March and fish with ice freezing to the guides and frozen fingers. For me it is a passage into spring knowing that things will get better. Although, that is not to say that fishing is bad in the winter it is really just a lot colder and more work. I remember back to one trip on the opening weekend in March of the Wisconsin catch and release season a number of years ago. According to my fishing journal it was a very cold day the temp was close to zero with a wind chill well below zero. I headed to my favorite spot on the Rush and was surprised to see two other cars of fisherman in the area. I suited up in layers and headed out walking down the stream. When I got to the spot I wanted to fish I had to figure out how I was actually going to fish the pool as there was quite a bit of shelf ice. After a few minutes I was able position myself where I could cast and make and drift through the pool. On about my fifth drift through I hooked a nice big brown. Now I had to land it. That meant I had to slide downstream across the ice to open water where I got it in the net, a good hookup, successful landing and release. During this process I did break off some of the shelf ice, so I figured I would now have to move farther upstream. I also noticed my net was a big block of ice, so I laid it in the water near the bank. I proceeded to cast a few more times and got another good hook up. This one I again played down stream to where I left my net and I was able to land it. After releasing the second fish I discovered that I had set my reel in the water and it was now frozen solid. At this point I decided that I should probably call it a successful day. 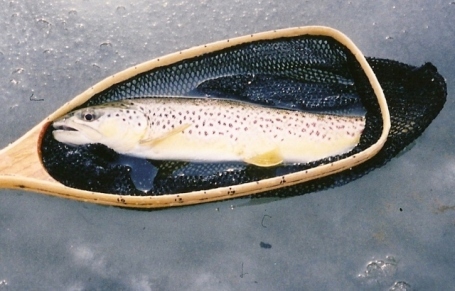 I had hooked, landed and released two fish, the first ended up being the biggest brown I caught that year.